Thursday 28th January. The weather is in synchrony with the season. Snow has somehow managed to penetrate the ever- present mantle of Manchester’s polluted air. The mercury hovers around zero. Vehicles are stranded, abandoned and on the pavements (sidewalks) people tread according to their age. The elderly with caution. The young progress regardless of the fact that there is absolutely no friction ‘twixt foot and the compacted, trodden snow. I also see the occasional T- shirt and shorts. What unaccountable science is going on here? I am bound for the Christie hospital for the first of nine treatments of acupuncture which might, hopefully, ameliorate the debilitating effects of the hormone therapy, which, in conjunction with radio therapy, is being employed to keep The Alien at bay. I find my way to the Re-Upholstery Department and, after only a short wait, am called, beckoned, welcomed and led into a small room. Anna has entered into my life. She sets about the chore of assembling some kind of patient profile. I can anticipate the questions, Anna cannot anticipate the responses. Allergies? Salads and children. My subsequent answers are equally informative. The profiling is quietly abandoned for the day, put to one side.I am already becoming aware of the fact that Anna has a natural calm, a serenity about her even to the pitch and cadence of her voice. Her persona, her profession a seeming perfect fit. And now it is down to the business. Within a few minutes twelve needles are growing vertically from my feet and legs. An extraordinary sight. Anna dims the lights and leaves me lying prostate(sic) on the bed. I am aware that on the other side of the door there is animated conversation, laughter, an energy and vibrancy which is acting as a counterpoint to my still, quiet room. I examine the shadows, the strange shapes from the dimmed lights which are now painted onto the walls. And the minutes glide seamlessly, imperceptibly by. A gentle tap on the door. Anna enters, my eyes adjust to the sudden brightness and the room becomes animated,filled once again with her practiced dialogue.In some strange way she has never left the room. The needles are removed, carefully counted. Am I supposed to feel any different? I take a quick inventory of myself. No, I don’t think so. But, during the following week, I experience half my usual number of hot sweats and, for several nights, sleep for more than my usual 4 or 5 hours. Seven days later I am in the same tiny room. Anna needs to know how I have reacted to the first session of acupuncture. The response, however, is not straight forward. The improvement on the frequency of hot sweats might be due to the fact that the week has been the last in the thirteen week cycle of Prostap (H.T.) injections which is my regime. I usually feel better at this stage. Or could it be that the acupuncture is already having beneficial effects? It is supposed to be an accumulative treatment. This line of enquiry is laid to rest. This week 16 needles sprout from my feet, legs, hands, brow and head. Anna is upping the game. A routine is already becoming familiar. Dimmed lights, a disappearing Anna, a sudden silence. Again, I am alone, insulated, surrounded by mute silhouettes drawn for a short while upon the walls. My environment at such variance with the energy and vitality that is just a short distance from me.Time feels to be suspended, somehow it takes on a different characteristic, felt rather than rationalised. Time drifts by, neither fast or slow. There are few references, no measures, hardly any delineation.And, as last week, I am keenly aware of the juxtapositon between my silent, still chamber and the animated bustle of the hospital. The gentle tap on the door, Anna materialises and brightness and normality are restored. She begins to explain some of the techniques that are involved in the mysterious art of acupucture whilst the needles disappear, one by one. This week we both count together. She begins to teach me some techniques which will hopefully help me manage the hot sweats which plague me each day and night.She refers to these as tools. This review is by Peter Byrom-Smith who is rather more than a critic. He is a composer, he lectures on musical composition and hosts a radio show on Fab Radio International. I always welcome being discussed, dissected by fellow musicians, especially when they are composers. They typically exhibit great dollops of empathy, perception and acuity when writing about my Non-Prescriptive compositional techniques. His review is most positive and his comments generous although, not for the first time, Scott McLaughlin’s magnificent notes receive some flack. I will again rise to the defense of Scott (that’s Dr. Scott) McLaughlin’s sleeve notes. Who, other than he is able to write with such clarity, erudition and authority about the insanity of quantum entanglement and the complexity of my compositional techniques? Yes, Scott also reads Difficult Science and has closely followed the evolution of my compositional techniques for many years. I know that many people, including reviewers, are dependent upon his notes to gain a greater understanding of my music. I do, however, have one quibble with the review. Mr. Byrom-Smith labels Entangled States as “An interesting concept album”. This is the first time any reviewer has used this term in connection with my music. I think that Mr. Byrom-Smith might be applying that word “conceptional” in the sense of an album whose parts hold a greater purpose collectively than they do individually – where the process of creation is more important than what is actually created, the idea or the concept being the most important aspect of the work as opposed to the outcome. I am guessing, surmising here. I have not discussed this with the author. My presumption may be way off-track. I might be interpreting his label wrongly. But he does refer to ES as “an interesting conceptual idea”. That’s a clue, isn’t it? If this is the case and my suspicion is indeed correct, then I must state that my Non-Prescriptive ideas, techniques and methodologies have been developed solely in order to achieve a quite specific end result. They have never been considered (until now ?) as an end in themselves. Allow me to extend two examples which I think are relevant to this point. Firstly, 12 Tone Rows or serialism. This once reactionary methodology is associated with Schoenberg and his contemporaries, the Second Viennese School, c.1920. This system was never an end in itself. It was developed essentially to challenge the traditional tonal, melodic and harmonic structures which had been the bedrock of western music for four centuries. The fundamental concept of the 12 Tone Row System was designed to give equal importance to each note of the diatonic scale. Doh was dead. Doh was no more! Atonality was the new big idea. Secondly, counterpoint, sometimes although not always correctly, referred to as polyphony. That’s my cavilling done with. That’s my two cents- worth. Think of it what you will. I do hope Mr. Byrom-Smith responds and that we can engage, exchange ideas, discuss this point. Is that label justified? The review is written by editor Jeremy Condliffe whose family runs this independently- owned weekly newspaper. Since it was founded in 1893 this journal has had only four editors. I find that quite remarkable. It typically distributes 16,000 copies across south Cheshire and north Staffordshire. “Ms Dullea improvises where she needs to, and like a good writer can ape the style of different people, she presumably does a good job of inserting what Craven wants; perhaps he doesn’t want anything, just something. He is non-prescriptive after all. “What does it sound like? It lacks most of what music normally possesses but is neither unstructured or formless … and it is never strident or intrusive. “It also reminds us of Steve Hillage’s seminal ambient album, Rainbow Dome Musick which just emerges for a while then stops. Monday 6th August. A blue sky, bright sunlight, temperatures in the high twenties. The heatwave continues and shorts worn with socks are now the fashion. I make my way to the Radiography Planning Department at Manchester’s Christie Hospital. The purpose of my visit is for a unique plan of treatment to be prepared. I have a CT scan which gives my cancer specialist, Dr. James Wylie, information from which he can devise the course which will last for four weeks. A calculated amount of high energy x-ray beams will be directed at the prostate. This will cause damage to the cells of The Alien which, in turn, will stop them from dividing and growing. The hormone therapy which I have had during the preceding six months has possibly decreased the size of the prostate by as much as 20 per cent and made The Alien more susceptible to RT. During the scan three tiny tattoo marks are made in specific areas on my hips and lower abdomen. This will enable the radiographers to set myself and the linac in exactly the same alignment for each of the 20 sessions. The scan also shows the precise location, size and shape of the prostate which ensures that the radiotherapy is targeted at The Alien and that the surrounding tissue – mainly the bladder and the colon – receive as little as possible. The First Week of Treatment. Monday 20th August. It’s still very warm but I forgo the shorts. I present myself at The Christie Radiotherapy Department and am directed to Suite 3. There are 11 suites in total. I am welcomed by staff clad in maroon coloured scrubs and am comprehensively briefed on procedures and possible side-effects. I am trained, prepared for what will very quickly become a familiar routine. I climb onto a table, there is a soft, yielding headrest and my knees are slightly elevated by a cushion. The tattoos are exposed and painstaking alignment commences. Small movements of myself, the table and the linac. Measurements are read and sharply defined green lines move over my lower abdomen. Millimetres are critical. The team become focused on the alignment. It has to be precise. They notify me that they are leaving to go to their shielded control area. The team can observe and talk to me via CC TV. Suddenly, silence, stillness. I concentrate on remaining perfectly motionless. I am not quite cognisant of what is to happen but the arms of the machine, a linear accelerator, which surround me begin to make noises and begin a slow 360 degree sweep in one direction, pause, generate different noises, and then proceed in a slow 360 degree rotation in the opposite direction. The machine is quite vocal. It sings its song. Whilst I am zapped by high energy x-rays I lie and listen to the music of the machine. There is no sensation and I am somewhat disappointed that a Star Wars-like coloured beam does not emanate from one of the pieces of equipment circling me. I am informed that each machine costs in excess of £3,000,000. The greater part of the linac is installed in and beyond the wall of the room at the head-end of the table. I am now an old hand. Grizzled, experienced. The staff and I are on first name terms. I am informed that I have, for some unknown reason, become one of their “favourites”. What have I done to deserve that honour? Can it be my happy socks? And halfway through the week the anticipated side-effects begin. I have read about them, been informed of them by the radiographers and now they are upon me. Urgency and frequency. I am given Tamsulosin by a doctor. It gives no apparent relief and my journey by metrolink tram to the hospital becomes increasingly fraught. The side effects become more acute and, by necessity, I am confined to quarters except for my daily commute to The Christie. I have now exchanged the mode of travel from the tram to a car. This journey typically takes 25 minutes. With some foresight and planning I can just tolerate this amount of time. My appointment times are helpfully changed so that I am able to travel when there is slightly less congestion on the roads. There is always traffic congestion in Manchester. It is the second most congested city in the UK after London. I am now visiting the bathroom 10 – 15 times during the night. I am becoming incredibly fatigued. I no longer go to my music studio (The Struggle). The beam is affecting my bladder and colon. So it’s time to turn up my resolve. I am determined to see this through. I am resolute. The equation consists of short term difficulties, inconveniences, disruption, against an extension of my life. It is a no brainer. And several of the radiographers have gleaned during our conversations that I am a composer. 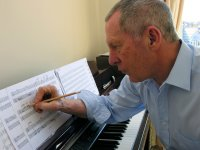 A few have read my blog and show an interest in my music. Next week I will present them with some of my CDs as a grateful thank you. It will be different from the cakes, chocolates, wine and flowers that constitute the usual currency of patients’ gratitude. The staff, are beyond praise. They help to create and sustain the ethos which makes this hospital such a special place. They are all mostly young, some having just completed their three years of training. When they are asked what they do, I would like to imagine their response as being along the lines of “I save lives and give people hope”. I am finding that the weekends of rest are necessary. I am informed that the tissue surrounding the prostate, which is suffering collateral damage from the radiation, can recover to some degree. Again I turn up the resolve button. I am reduced to a state of almost total exhaustion, this post has taken several days for me to write. Interesting prose and wit elude me. As ever the days slip by. Time is slowed. It is moving slower than the rate of tectonic drift. There has been no respite from the side effects of urgency and frequency. Doctors inform me that this is not uncommon and that the condition will typically continue for six to eight weeks after completion of the course. The final date of treatment at last becomes the present. It is Friday 14th September. My course of treatment commenced in hot Summer weather, today it is distinctly Autumnal although the leaves have not yet begun to fall. Two radiographers, Thomas and Aneeka, guide and instruct a student who has difficulty in manoeuvering my body into the correct alignment. She will learn. There is an air of celebration. We joke (“Here I lie prostate before you”). The machine commences its circumnavigations and sings its song. We hug and say our goodbyes and I bid my farewell of these special people. Previously, when the bell has been rung, I, together with all the others in the vicinity have applauded. That signifies many things including feelings of empathy and brotherhood (sisterhood?) And now it’s my turn. I have been waiting a long time for this. I grasp the plaited rope and ring the bell the required three times fortissimo. I leave the hospital with layers of complex emotions. 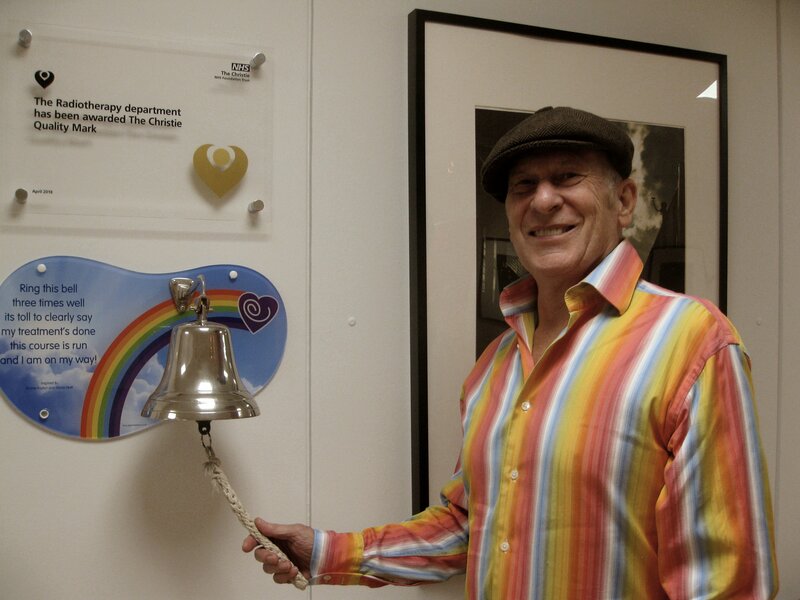 It is often an emotional moment when patients who have completed their course of chemo or radiotherapy get to ring the bell. And there is a fascinating, rather magnificent history attached to this celebration. Emma Payton was eight years old when she was diagnosed with a rare form of soft tissue sarcoma on her face. After some treatment at The Christie it was decided that she would benefit from Proton Beam Therapy. At that time The Christie did not have this technology so Emma went to a hospital in Oklahoma, USA. There, on the final day of her treatment, she rang the bell. It was an already established tradition. Her family were so inspired by the moment that they have since donated almost 200 bells to hospitals across the UK. When the bell is rung everyone in the vicinity, staff and patients, stop what they are doing and applaud loudly and enthusiastically and with recognition. This year The Christie Proton Centre opens for business. Emma and her family have reserved the special one hundredth gold bell for the proton beam therapy department. I am informed that the side effects of the RT will take 6 – 8 weeks to resolve. During this period I will adopt a period of iron discipline. I will consider eating lettuce, having an alcohol free day and inducing sleep by listening to minimalist music. I have acquired a pedometer app on my phone. I will acquaint myself with this toy, mindful of the fact that my walks around the ‘hood will, by necessity, have to remain within a short distance of the bathroom and I will watch programmes on the TV which show people running very quickly. Exercise by proxy. 30 months of HT (Prostap) lie ahead. I will seek to find ways of mitigating the prominent side effects of this which are, for me, fatigue, breathlessness and frequent hot sweats. As soon as it is possible I will resume the commute to the Struggle and summon the required level of cognitive energy that I need to compose. My music is perhaps the principal victim of this rather unfortunate period in my life. I am all too aware, despite the last line of the verse attached to Emma’s bell, that my journey, as Florence refers to it, is far from over. Dr. Wylie informs me that my type of cancer is slow to react to the treatments and that it will be six months before he will be able to assess the damage sustained to The Alien which is persistent and intelligent. It is able to adapt and react to HT. It is a wily beast. (Sorry Doc, I couldn’t resist). The engagement between The Alien and medical science is far from the end. It is neither won nor lost. Perhaps it is simplistic to think in terms of winning and losing. Perhaps it is best that I don’t think in these terms at all and just get on with my life, my music.